World War II Royal Air Force flying ace Group Captain Sir Douglas Robert Steuart Bader, CBE, DSO & Bar, DFC & Bar, DL, FRAeS sadly died 5 September 1982, at the age of 72, following a heart attack. He was born 21 February 1910 in St John’s Wood, London. In 1912 Bader joined his parents in India in 1913 the family moved back to London. and settled in Kew. Bader’s father saw action in the First World War in the Royal Engineers, and was wounded in action in 1917. He remained in France after the war, where, having attained the rank of major, he died in 1922 of complications from those wounds in a hospital in Saint-Omer, the same area where Bader would bail out and be captured in 1941. Bader’s mother remarried shortly thereafter to the Reverend Ernest William Hobbs. Bader was subsequently brought up in the rectory of the village of Sprotborough, near Doncaster, West Riding of Yorkshire. He was first sent as a boarder to Temple Grove School, which gave its boys a Spartan upbringing. It is likely that Bader’s Spitfire W3185 came down at Mont Dupil Farm near the French village of Blaringhem, possibly near Desprez sawmill. A French witness, Jacques Taffin, saw the Spitfire disintegrating as it came down. He thought it had been hit by anti-aircraft fire, but none was active in the area. There were also no Spitfire remains in the area. The lack of any remains was not surprising, owing to the Spitfire breaking up on its descent. Historians have also been misled as to the whereabouts of the Spitfire because of a mistake in the book Reach for the Sky, in which Bader stated his leg had been dug out from the wreckage but was damaged, indicating a definite crash site. Bader’s leg had actually been found in an open field. The quest to find Bader’s Spitfire, W3185, shed light on the demise of another famous wartime ace, Wilhelm Balthasar, Geschwaderkommodore of Jagdgeschwader 2, who was killed in action on 3 July 1941 when his Bf 109F crashed into Ferme Goset, Wittes, France. Bader escaped from the hospital where he was recovering by tying together sheets. Initially the “rope” did not reach the ground; with the help of another patient, he slid the sheet from under the comatose New Zealand pilot, Bill Russell of No. 485 Squadron, who had had his arm amputated the day before. Russell’s bed was then moved to the window to act as an anchor. A French maid at the St. Omer hospital attempted to get in touch with British agents to enable Douglas to escape to Britain and obtained a letter from a peasant couple (a Mr. and Mrs. Hiecques), who promised to shelter him outside St. Omer until he could be passed further down the line. Until then, their son would wait outside the hospital every night until there was a chance of escape. Eventually, he escaped out of a window. The plan worked initially. Bader completed the long walk to the safe house despite wearing a British uniform. Unfortunately another woman at the hospital betrayed his whereabouts He hid in the garden when a German staff car arrived at the house, but was found later. Bader denied that the couple had known he was there. They, along with the French woman at the hospital, were sent for forced labour in Germany. The couple survived. After the war, French authorities sentenced the woman informer to 20 years in prison. Over the next few years, Bader made himself a thorn in the side of the Germans. He often practised what the RAF personnel called “goon-baiting” and considered it his duty to cause as much trouble to the enemy as possible and made so many escape attempts that the Germans threatened to take away his legs. In August 1942, Bader escaped with Johnny Palmer and three others from the camp at Stalag Luft III B in Sagan. However, a Luftwaffe officer of Jagdgeschwader 26 was in the area. Keen to meet the Tangmere wing leader, he dropped by to see Bader, but when he knocked on his door, there was no answer. Soon the alarm was raised, and a few days later, Bader was recaptured. He was finally dispatched to the “escape-proof” Colditz Castle Oflag IV-C on 18 August 1942, where he remained until 15 April 1945 when it was liberated by the First United States Army. After returning to Britain, Bader Led a victory flypast of 300 aircraft over London in June 1945. On 1 July, he was promoted to temporary wing commander. Bader began looking for a post in the RAF. Air Marshal Richard Atcherley, a former Schneider Trophy pilot, was commanding the Central Fighter Establishment at Tangmere. He and Bader had been junior officers at Kenley in 1930, while serving in No. 23 Squadron RAF. Bader was given the post of the Fighter Leader’s School commanding officer. He received a promotion to war substantive wing commander on 1 December and was promoted to temporary group captain. After the War fighter aircraft’s roles grew significantly and Bader now spent most of his time instructing on ground attack and co-operation with ground forces. Bader did not get on with the newer generation of squadron leaders who considered him to be “out of date”. Air Marshal James Robb offered Bader a role commanding the North Weald sector of No. 11 Group RAF, an organisation steeped in Fighter Command and Battle of Britain history. Bader would have stayed in the RAF has his mentor Leigh-Mallory not been killed in an air crash in November 1944, after which Bader’s enthusiasm waned. Bader left the RAF permanently in February 1946 with the rank of Group Captain. Bader considered politics, and standing as a Member of Parliament for his home constituency in the House of Commons. He despised how the three main political parties used war veterans for their own political ends. Instead, he resolved to join Royal Dutch Shell became Managing Director of Shell Aircraft until he retired in 1969. During the 1950s, a book and a film, Reach for the Sky, chronicled his life and RAF career to the end of the Second World War he also served as a technical advisor to the film, Battle of Britain. Bader also campaigned for the disabled and in the Queen’s Birthday Honours 1976 was appointed a Knight Bachelor “for services to disabled people” and continued to fly until ill health forced him to stop in 1979. He also read a eulogy at the funeral of Air Chief Marshal Keith Park. The International Day of Charity is observed annually on 5 September. The prime purpose of the International Day of Charity is to raise awareness, enhance visibility, increase solidarity, social responsibility and raise public support for charity through special events, and to provide a common platform for charity related activities all over the world for individuals, charitable, philanthropic and volunteer organizations for their own purposes on the local, national, regional and international level. The date of September 5 was chosen to commemorate the anniversary of the passing away of Mother Teresa of Calcutta, who received the Nobel Peace Prize in 1979 “for work undertaken in the struggle to overcome poverty and distress, which also constitute a threat to peace. Also In response to a proposal by Hungary, the United Nations General Assembly adopted a resolution by consensus to designate 5 September as the International Day of Charity. The resolution was co-sponsored by 44 UN Member States (Albania, Angola, Australia, Belarus, Bosnia and Herzegovina, Bulgaria, Cambodia, Chile, Croatia, Dominican Republic, Eritrea, Estonia, Georgia, Greece, Guatemala, Honduras, Hungary, India, Ireland, Israel, Italy, Jordan, Kazakhstan, Kyrgyzstan, Latvia, Lebanon, Lithuania, Luxembourg, Macedonia, Madagascar, Malta, Montenegro, Pakistan, Poland, Republic of Cyprus, Republic of Korea, Romania, Serbia, Singapore, Slovakia, Slovenia, Thailand, Turkey, Ukraine) representing all five Regional Groups of the United Nations. The General Assembly invited Member States, organizations of the United Nations system and other international and regional organizations, stakeholders, as well as NGOs of the civil society, to commemorate the International Day of Charity in an appropriate manner, by encouraging charity, including through education and public awareness-raising activities. On 5 September 2013, the Permanent Mission of Hungary to the United Nations, marked the first commemoration of the International Day of Charity at the United Nations Headquarters in New York, in co operation with the United Nations Development Programme, the United Nations Foundation and with the support of the United Nations Department of Information. The commemoration included keynote speeches by Assistant Secretary-General Robert C. Orr, Kathy Calvin, President and CEO of the UN Foundation and Hugh Evans, CEO of the Global Poverty Project. Two panel discussions moderated by Matthew Bishop from The Economist and Ruma Bose, author of Mother Teresa CEO, explored the role of charity in poverty alleviation and in promoting access to clean water and sanitation. Speakers represented leading organizations in the field of philanthropy, including charity: water, WaterAid, The Resource Alliance, the Foundation Center and The Coca-Cola Foundation. Discussions focused on lessons learned and the role of the non-profit sector in the implementation of the Post-2015 Development Agenda. The Secretary-General sent a written message on the occasion of the International Day of Charity. In 2013 the Apostolic Nunciature and the Embassy of the Republic of Albania organised a number of special events, in Tirana, the capital , including a mass, a photo exhibition and a donation on the occasion of the first International Day of Charity. Qatar Red Crescent and The Ritz-Carlton Doha celebrated the International Day of Charity and dedicated to Syrian children under the slogan “Bringing Back Their Joy”. Devotees and volunteers of the Hungarian Society for Krishna Consciousness held a special free food distribution program in the heart of Hungary’s capital Budapest, serving 500 plates of vegetarian meals, yoghurt, fruits and sweets hourly” The Holy See also issued a press release on the International Day of Charity. Often Considered one of the greatest vocalists in popular music, The late great Freddie Mercury was born 5 September 1946 in Stone Town on the African island of Unguja, Mercury attended St. Peter’s boarding school near Bombay (Mumbai) where he learned to play piano and joined his first band, The Hectics. He completed his education in India at St. Mary’s High School in Mazagon before returning to Zanzibar. Freddie came to England in 1964 and earned a Diploma in Art and Graphic Design at Ealing Art College & later used these skills to design the Queen crest. Despite the fact that Mercury often wrote very intricate harmonies, he claimed that he could barely read music and wrote most of his songs on the piano, often choosing keys that were technically difficult. Mercury also possessed rudimentary skills on the guitar & wrote many lines and riffs for the instrument, including many of those heard in “Bohemian Rhapsody” and “Crazy Little Thing Called Love” on the guitar. He went on to write ten out of the seventeen songs on Queen’s Greatest Hits album, including Seven Seas Of Rhye, Killer Queen, Bohemian Rhapsody, Somebody To Love, Good Old-Fashioned Lover Boy, We Are The Champions, Bicycle Race, Don’t Stop Me Now, Crazy Little Thing Called Love, and Play The Game. Mercury was diagnosed with HIV in the spring of 1987 but continued to deny that he had the disease. Despite this there were many rumours fueled by Mercury’s increasingly gaunt appearance during the last years of his life, particularly in his last appearance on film, the These Are The Days Of Our Lives promo video, which suggested serious illness. On November 23, 1991 he issued a statement confirming that he had been tested HIV positive and had AIDS. 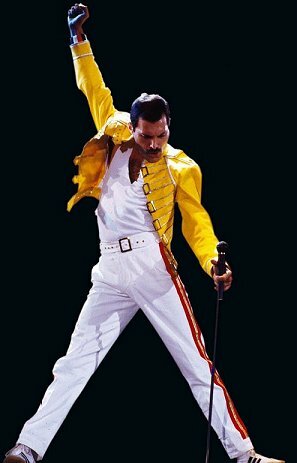 On 24 November 1991 Freddie Mercury died at the age of 45. The official cause of death was bronchial pneumonia resulting from AIDS. Mercury’s funeral was conducted by a Zoroastrian priest and he was cremated at Kensal Green Cemetery. the whereabouts of his ashes are unknown, although some believe them to have been dispersed into Lake Geneva, or in his family’s possession. The remaining members of Queen founded The Mercury Phoenix Trust, and organised The Freddie Mercury Tribute Concert. Freddie Mercury has consistently ranked in the number one position on a list of the 100 greatest rock vocalists. In a list of the greatest English language singers of the 20th century, compiled by BBC Radio, he was the highest-ranked hard rock vocalist, . He also came in second in MTV’s list of the 22 greatest singers of the past 25 years. In 2006, Time Asia magazine voted Mercury as one of the most influential Asians in the past 60 years. The 1999 Millennium Poll, in which six hundred thousand Britons participated, he was voted into the number 14 and 15 spots as a popular musician and songwriter, respectively. Mercury ranked at No. 58 in the 2002 list of “100 Greatest Britons”, sponsored by the BBC and voted for by the public.